TriX is a hotkey-based productivity tool that does many simple tasks with key combinations including text formatting (upper case, lower case, sentence case…), web search (Google, Bing, YouTube, etc. ), data exporting (Notepad, MS-Word, MS-Excel…), data extraction (emails, links…), and more. Note: Website offline - linking to archive.org. Fix: Blocked tab key on application's forms. 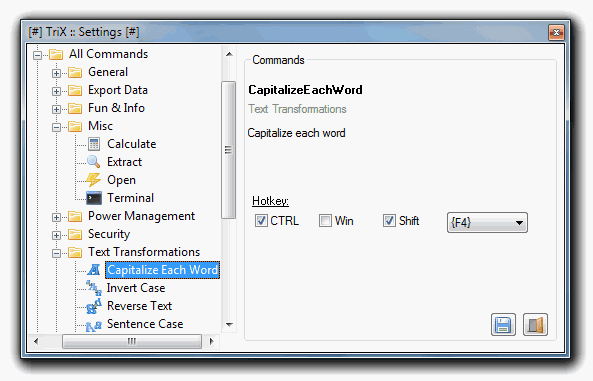 Fix: Remove ";" character when exporting to Excel. Imp: TriX will now try to fix settings file automatically if it is corrupted. New: "Text Manipulations / Expand Text": Expand selected text and replace with text in a clip. New: "Text Manipulations / Phonetic Alphabet": Substitute the NATO alphabet telephony for independent letters and numbers. I've found the solution, thanks. The application runs quite well. TriX takes little under 25M of my memory on XP. And next to nothing is customizable in it :) Language and text tools are good. First of all - I'd like to thank you all for giving TriX a try and I hope you found it useful and fun to have. Tim has kindly brought to my attention that someone has claimed that TriX is a Trojan. I can assure you all that TriX is 100% clean, that it is nor malware neither spyware. I created this tool for myself, but when I realized that it can help many others, I decided to share it for free as I use lots of freewares myself. As normanel & port32 wisely wrote - TriX was tested and found clean by the world's leading downloads websites, such as Download.com, Softpedia, Softonic and more. I encourage you all to give TriX a try; I promise you will find it useful and time saver in no-time. normanel is Right, none of these worldwide known downloads websites will take such a risk and grant a program 100% clean certificate while it is a malware. TriX is a trojan? Are you kidding me? So what you are saying that the scanners and tests of dowonload.com / softonic / softpedia and more found TriX 100% clean, but your MalwareBytes has flagged it as a Trojan??? My MalwareBytes has flagged the extracted trix.exe from trix.zip downloaded from the link provided by this page has Trojan.Phires. I suspected I had a virus when my computer started restarting without reason at about the time I was testing trix.exe. I never suspected it would be trix.exe because I've always believed that the softwares recommended here are virus/spyware free until I did a scan and found out trix.exe has Trojan.Phires. Careful everyone. Neat program indeed! As for the stealth - I disagree with you since it seems that the auto startup is achieved just by adding a shortcut in your startup folder, I couldn't find any new registry key created by this program. Anyway, you can change this behavior as well if you want from the settings window. Neat Program. Not mature yet though. Program messes up other programs because other program started acting weird after using some Trix commands. It's not really stealth because it automatically starts up when windows starts up, which tells me it adds something some where. Still, it's a neat program only after the kinks get sorted out. There is a newer version, 0.0.10.7 with more cool features, like converter and translator. Clearly a work in progress... the automatic shortcut creation issue has been fixed (it's now manual, via the settings) and the programmer seems to be fixing bugs almost immediately they're brought to his attention. Conceptually, it is a very interesting application, but it is poorly implemented. And some of its features don't quit seem to go together. Another case of a programmer trying to stuff as many functions into a single application as possible. @Dan: not if launched from the flash drive! Not stealth. It creates a desktop shortcut to TriX.exe every time it runs.